Still Rock Water, by Francene Stanley, will soon be published in paperback in addition to the recently released ebook. What if every thought influenced events around you, even in far distant lands? What if brain waves are as real as the ever changing sea? Rather than dreaming at night, Liliha witnesses a flood on the other side of the world during the daytime. She is not watching the tragedy unfold on television, but in her own mind. By directing her thoughts, Liliha discovers she can guide bystanders to help the victims. Back in her own kitchen, she dismisses the strange vision as a dream. However, she hears coverage of the disaster on the overseas news. Despite her unique ability, which grows stronger with each vision, Liliha is powerless to change her depressed, belittling husband. Betrayed, Liliha strives for a fresh start. Will moving half-way around the world for a fresh start bring the happiness Liliha envisions? 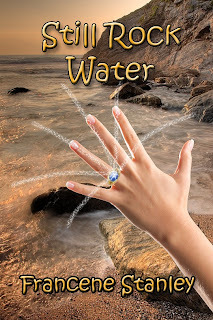 Solstice Publishing placed Still Rock Water, in their paranormal category-and rightly so, however it's also a love story. Get better acquainted with Francene , and here. I can only recommend this enchanting novel. The paperback would make a great gift, with holiday season around the corner.